The 2008 Beijing Olympic Games will offer a great legacy for China, Jacques Rogge, president of the International Olympic Committee (IOC), said yesterday on the eve of the one-year countdown to the world's greatest sporting event. Liu Qi (left), president of the organizing committee of the Beijing Olympics, and IOC president Jacques Rogge attend a volunteers' oath-taking ceremony yesterday in the capital. "Bringing Olympic values to one-fifth of the world's population is arguably one of the most exciting projects in Olympic history," he told the opening ceremony of the first seminar of the Chefs de Mission for the 2008 Summer Games. Rogge also said the IOC was impressed by what Beijing had done to prepare for the Games. 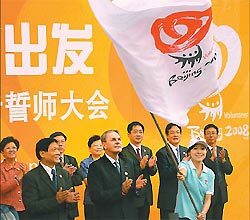 "The preparations for Beijing 2008 are truly impressive in every regard," said Rogge. "I am confident that the dedication of the Beijing Organizing Committee (BOCOG) and the Chinese Government these past six years has laid a solid foundation for a spectacular Summer Olympic Games." Although Rogge's visit to the Chinese capital was marked by heavy rains and cloudy skies, the president said he has confidence in Beijing's environment during the Games and praised the "fantastic job" of BOCOG. "Here, let me tell you that BOCOG has done a fantastic job: from 'greening' initiatives whereby Olympic-related building projects will include 40-50 percent green space, to recycling programs," he said. "There is no question that programs driven by the Games in areas related to the environment are building best-practice examples not just for today but for future generations in China." Noting that there will be some contingency plans during Games time, Rogge said: "It is important to stress that our Chinese colleagues are doing their utmost to deal with this challenge. We are very hopeful the matter will be tackled effectively." BOCOG President Liu Qi stressed that BOCOG will follow three principles in the provision of Olympic services, including abiding by IOC rules and international practice, adopting a unified standard in the treatment of all foreign guests. "We want all the guests to feel at home during the Beijing Games," Liu said. According to Olympic practice, the seminar is held one year before the Olympic Games, aimed at briefing all delegations on the progress of the preparatory work for the Olympics.